Dave & I have been married 23 years. We have two children -Savannah -13 and TJ - 8. Through the years we have had some rough patches. With all rough patches you say, next year will be different and we can put this all behind us. Little did we know that the next rough patch would truly change everything. At a routine visit to my gynecologist, she noticed a lump and decided I needed to have a mammogram to rule out any problems. I was 39 at the time. I honestly never even noticed the lump until they pointed it out to me. After the mammogram and sonogram, they told me they wanted me to have a biopsy. I was not the least bit worried. Women do this all the time and it turns out to be nothing. Dave was more worried than I was. I will never forget that call. It was month end at work and Dr. Candy Arentz, who was the surgeon, called to tell me it was cancerous. I completely froze. I couldn't even talk I was so shocked. And so began the process of appointments and gene tests. We decided to wait on the results of those before scheduling any surgery. We thought the tumor was only about 2.5 cm based on the sonogram and there was really no hurry for surgery. It was Invasive Ductal Carcinoma, Estrogen Positive. The Genetic report ruled out that I was a gene carrier. That was good news for my family. The standard for my type of cancer and size of tumor was surgery to remove the tumor and radiation to follow. I scheduled the surgery for March 23rd. Three days after my 40th birthday. Seems I could only deal with one thing at a time and turning 40 was a lot. Once they got into surgery, they realized the tumor was double the size they thought. Because of the size and it also affected the lymph nodes, I now had to have chemo. This was a huge blow. I had already resolved that I would not have to do chemo. I would not have to lose my hair. Losing my hair was a really tough process. I met with oncologist Dr. Jenny Chang in Houston hoping to get an alternative to chemo. Then back to Lubbock to meet with my oncologist Dr. Catherine Jones trying to "get out" of doing chemo. In the end, I knew that it was the right course for me to take. I had two children to raise and wanted to live the best life I could for them. I remember walking into the chemo room for the first time and I was terrified. I was trying so hard not to cry. I had the most amazing nurse. She looked me right in the eyes and said you are going to be ok. You've got this. And I knew instantly she was right. Once I started chemo, it only took about two weeks for my hair to start falling out. I figured out I was ok with it and just needed to process losing my hair in my own time. I actually let my hairdresser cut it once to minimize the loss. And then one day I woke up and decided I was ready to shave it off. I was so thankful for my hair dresser. We have been friends for so many years and she also lived around the corner from my house. She told me, when you're ready call me and I will do it at the house. I didn't have to go to the salon and worry about who was watching. Once I decided to shave my head it was such a release. I discovered how easy it was to go anywhere and not have to get my hair ready. I had bought a beautiful wig for work and certain functions, however my hair started growing back just slightly and once it did the wig became very itchy and uncomfortable. I wore lots of colorful head wraps. No scarves for me. Those were too hard to tie. My husband was there for every single appointment and every single treatment. He even shaved his head into a mohawk that he dyed pink. I could not have done it without him. My mom was there to take my kids on the weekends when I had treatment so that they didn't have to sit around the house. My dad was there to help with the kids and cook meals for us. I actually tolerated the chemo very well. I had minimal side effects and I was able to function pretty normally between the hard treatments. I was really blessed to have a job where I was able to work from home on the day of chemo and the day after. Then I had the weekend to recoup and be back on Monday. I had chemo from May to September. In September, my wonderful sister in law took me to the Bahamas for some much-needed rest and relaxation. Right after I finished chemo, t found out my company was selling. I was keeping my job, but my wonderful coworkers who had been so supportive, would not keep their jobs. This was another transition in my stressful year. It ended up working out and I am happy with the way the new company has evolved. October, I started radiation and finished the week of Thanksgiving. This was something to truly be thankful for. I remember when it was time to get my port out I was so ready. I didn't even realize what a relief it was until it was out. I could just feel this huge weight lifted off of me that I could close off one piece of the journey. I could truly move forward with the feeling that we are at the end of this chapter. The next chapter is to stay on the Tamoxifen and monitor. The year after my diagnosis, Dave had to have a hip replacement. He went through a lot of pain the year I was diagnosed because he wanted me to get well first. He didn't even know that's he was headed for a huge battle as well. Between his health struggle and mine, it truly changed our perspective on life and how we are living it. Through this process I told myself it is only one year of hard times to be able to be there for my kids for a lifetime. I am thankful every day to be here and be healthy. Monte and I have been together for about 12 years—three years of this was a long distance relationship. He was living in Florida and I in New York. We traveled back and forth to see each other as people kept whispering, "it will never work, distance never does." Monte was working for Harley Davidson at the time and was their top salesman. I was working for one of the top I.T. employment agencies in New York for 23 years as a Manager and Sr. Technical Recruiter for the finance industry. I was earning a very good living and had finally met the man that I could see spending the rest of my life with. I’d never met anyone like him and never had the same feeling for anyone else like I had for him. As much as I wanted children—I knew I was missing this window—I did enjoy being around Monte's kids. It all just felt right. New Year’s Eve of 2005, Monte proposed to me. We planned a beautiful engagement party. Monte was still in Florida, but being the gentleman that he is and not wanting to take me away from my family, he moved to New York in 2006—a true sacrifice as he hates the cold weather and loves Florida. Our engagement party was June of 2006. We figured we would take some time and save some money before we booked a wedding. While everyone kept asking us, "when is the date," one of my worst nightmares was about to come true; my very healthy boss, out of nowhere, got diagnosed with Pancreatic Cancer and closed the doors of our company in 2008 and passed away a few months later. This was all very traumatic for me. So, there I was without a job for the first time in my life after being with the same firm for 23 years. The job market at the time was very hard. Since I could do my business from home, I formed my own corporation and decided to try it to work for myself. Knowing that most agencies were not giving benefits due to the economy, I had to start paying for my own benefits. Needless to say, this depleted the money I had saved for years, and it just got worse and worse. I tried to hook up with as many agencies as I could for work but still there was not a lot of job opportunities. In the meantime, Monte's business was also down so we continued to struggle and struggle. He also had two hospital stays, one in 2011 and one in 2013. I went through my retirement savings and had to take a penalty for that as well. Also, I went through my refinance savings. Everything was gone. Every day I would just pray for a placement in order to pay my bills. So, as everyone continued to ask for a wedding date, I would just smile and say, "we haven't gotten to it yet!" I would always repeat, though, that "nothing is that bad, as long as you have your health." I was very healthy, ate well, was very active, and had loads of energy. But I had a lot of stress. I come from very good genes from both my mother and father—no diseases. I started my mammograms at the appropriate age at NYU Langone Medical Center in New York and never missed one year. One night in February of 2014 I went to sleep like usual with no issues, but woke up with a golf ball-sized growth sticking out of my left breast. At first I thought, "this is nothing, it was always here." But I knew it really was not. I just thought it was hormonal and let it go for two months thinking it would go down with each menstrual period, but it did not. In April, I went back to the doctor who just did a breast exam on me and he was shocked to see this. He told me it was probably a cyst and that I would need to have it aspirated. I went for the ultrasound and could tell by just reading the doctor's face that it was not a cyst. She told me there was a problem and told me I also had an enlarged lymph node. I knew nothing about this so I immediately started to Google my symptoms and drove myself crazy. A few days later as my Mom sat in the waiting room, I went for the biopsy and heard the words "You have ‘it’ and it's also in a node." I didn't cry; I remained strong because I had to go out and tell my Mom who was sitting in the waiting room with her rosary beads. Monte went to tell my Dad because he knew something was wrong when I wasn't answering my phone. He cried like a baby for hours. My only thought was, "what did I do wrong?" My diet consisted of salmon and vegetables, fruit, no red meat and chicken caesar salads. I blamed it on my love for pizza and a glass of wine that I would have at night to calm me from all the stress that I was dealing with. Breast cancer was not in my family so why is this all happening to me? What about my job? I can't move on with my fiancee now that I am sick. How would I ever get through any of this? I’ve just heard about cancer but never thought it could happen to me. Why didn't NYU take sonograms (they do now) knowing I had very dense breasts and why, when they saw calcifications in my left breast, did they not look in to it? These were the thoughts racing in my mind, but I knew there was no answer that was going to change what I was about to face. I did my research; I found a top notch surgeon, oncologist and plastic surgeon. After meeting with the surgeon I knew he was the only one that I wanted to operate on me. He was everything everyone said about him. When he told me I had invasive lobular carcinoma (ILC), that only 10 to 15% of women have this type of cancer, and that my tumor was 6 cms, I became numb. When he told me I would need chemotherapy first, my heart sank. I was known to be the "girl with the hair," long blonde streaks down to my waist and now I knew what was coming. How could I deal with this? My hair was so special to me, but like my job and my boss, it was all being taken away from me. When you don't have a choice in your life, you do what you need to do. There I was in the chair with my very long hair in pony tails, each one getting snipped off and all of a sudden I looked like a boy. This is when I cried; it all surfaced. My sister-in-law and cousin then took me to get a wig, a wig that the insurance company told me they would pay for. It took eight months for my insurance company to pay me for the wig while I had to make endless phone calls and write numerous letters. Monte was with me through every chemo treatment. The first day I just cried going in that room, I was so scared. I do feel very blessed that I did sail through the chemo very well and never got sick. Maybe it’s because I did lead such a healthy life; who knows? I finished the chemo in November 2014 but had to wait until January to have surgery due to having to change my insurance in order to get my surgeon, which of course cost more money, but once again, I felt I had no choice. My surgery went very well. The M.R.I. pryor showed no sign of cancer and that the chemo wiped it all away. But the pathology report showed a 3 cm tumor and three positive nodes, although very little cancer was in the nodes. I did have clean margins. My family has been right by my side the entire time. My mom never left the hospital for four days when I got sick from the pain medicine and had to stay in the hospital. Monte has been my Rock; he’s been with me to every doctor's appointment, everything. I have also had radiation and I have been on Tamoxifen for two years now. I feel like it never ends, but, yet I am grateful because it could be so much worse. I was getting hit with co-pays all over the place and just continued to struggle financially. I wonder why Monte and I can't get a break. I just tell myself I’ve had some pretty bad luck but there is something waiting for me after all of this. I truly believe in Hope and never give up on anything. Like all of us, I get my days of flashbacks and feeling scared of every ache and pain but I try to turn every negative in to a positive! Fellow advocate,Terry Arnold was diagnosed with inflammatory breast cancer in 2007. Even today, IBC is poorly understood and often misdiagnosed. If you are not familiar with IBC, you are not alone. In her post Terry shares some of her own personal story as well as what motivates her to push forward in her efforts to increase awareness and research efforts for IBC. When I was first handed my cancer diagnosis, I went through a range of emotions, reactions and coping skills. Flashing back to the late 1970’s when my grandfather was diagnosed with lung cancer, I remembered my family whispering the “C” word. We were afraid if the word cancer came out of our mouths, it would somehow boomerang back and get us all. Knowing how barbaric cancer staging was at that time, I can understand the fear. The thought of undergoing exploratory surgery just to know how advanced your disease was makes me shudder. The flip side of not being afraid is showing (or trying to show) our brave side, so we celebrate with pre-victory parties. I did. I didn’t know what else to do. We call in all our girlfriends and put on brave faces vowing to “beat it” and not look back at what was just a bump in the road. Some of this might be due to some unacknowledged pressure from the “fight like a girl” banter that we are inundated with or some leftover poorly applied post-feminist fallout that our breasts don’t define us. I realize, of course, that we are more than our breasts…but if someone loses their hand to a disease or accident, he/she is not told, “Well that hand does not define you”, so why are we guilted out by mourning the loss of a part of our body? In my cancer treatment experience, I was cheered on, told to be powerful, be my own best advocate and be in charge of my journey. Always one to go my own way regardless of what others thought, I was comfortable with that. Being in charge was a little harder than I expected. I was ill, green and hurting, but eventually my treatment was completed and cancer was not in control of my body anymore. Now this is where I get to the glass ceiling – living post cancer, which sometime feels more like a glass box. The view is good, but I have limits on how far I can go. When I was diagnosed with this rare disease, I was shocked. How could I have not heard about this lump-less form of breast cancer which does not show up on a mammogram? When my treatment was done and I wanted to apply my hard-earned knowledge to help other women with the same diagnoses, that’s when I hit that glass ceiling. It seemed my superpowers were only expected to go so far. Told to not let my cancer be more than a speed bump, suddenly there were limits. I was told to go back to my old life and enjoy each day to the fullest. But like being at a loud rock concert, where that white noise rings in your head all the next day, I couldn’t hear people well…and I couldn’t forget what I saw. I saw very young women dying of something that no one was talking about. IBC is an “orphaned” form of breast cancer first written about almost 200 years ago, but mentioned only in passing with little or no attention paid to it until recently. Discovering this was maddening to me, because IBC has the highest percentage of death of all known forms of breast cancer. To die from IBC is a hard death, a painful one, but to live after it is painful too because you would do anything you could to save someone else from that suffering. I understood those who reminded me I was supposed to be grateful I was alive, get over it, get on with things and get reconstruction, as if my wholeness was waiting for me at the plastic surgeon’s office. I was grateful, but I was also outraged. Was this where my road was to end? What was I to do for the betterment of the cause? Every “pink” door I knocked on led to disappointment and more ringing in my head. The sound I heard was the voices of women, IBC patients and their families, many who became close friends of mine, pleading with me to tell someone, to do something about IBC. It seems though, that I can only be an advocate up to a point that is not uncomfortable for others. It also seems that many people are convinced that we do not have to fear breast cancer anymore and certainly we are not supposed to die from it. I feel like the guardians of our cancer health and especially breast cancer health have let me down by not talking about IBC. Rare does not mean never and even if the knowledge we are given about this disease that typically does not show up on a mammogram, has no early detection, can’t be discovered earlier than a stage three and has a low survival rate is a frightening reality, it can’t be more frightening than being handed that diagnosis. We need to talk about the “uncomfortable” forms of breast cancer, like Triple Negative and Inflammatory Breast Cancer. The first step to a cure is discussion. Discussion will lead to education, knowledge and research and in time, pray God, a cure. I am a Virgo, a known hypochondriac. I was meticulous about doctor’s checkups. I got my baseline mammogram at age 35 and then yearly at 40. A year before I was diagnosed with what came to be Stage III breast cancer, one of my sister's was diagnosed with ovarian cancer. I ran to my Ob-Gyn and took the BRCA test. The results came back negative. Now with a family history of ovarian cancer and because I had endometriosis, I started getting pelvic sonograms every six months, just to be safe. A few months later, I noticed a crease on my breast during a summer vacation and made a “note to self” that when I got back to New York, I needed to get a mammogram—not that I thought I had breast cancer, but for vanity purposes as it was not very becoming on me. Had I not told the technician that I suspected something, it would not have found it because I have "dense" tissue. They immediately took a sonogram and biopsies on both sides. I left knowing that this wasn't going to be the last of my ordeal. Sure enough, I got the call at work two days later—the left side was cancer. I was in a glass conference room when I called them back and it wasn't pretty for those sitting on the trading floor, seeing someone do the ugly cry. One of my other sisters happened to be in New York having dinner with someone who is very well connected to Presbyterian/Weill Cornell hospital. By the time they finished dinner I had an appointment in two days with a top surgeon. From there it was a roller coaster. I now had a new list of doctors—surgeons, oncologist, radiologist, a therapist and most daunting, appointments at wig shops. I had adjunct chemotherapy first. My cocktail was ACT—Adriamycin, Cytoxan and Taxol. I went home and didn't Google anything on breast cancer. EVERYONE'S cancer is different. People react in different ways. Mine was to leave it all up to the pros. I was going to go to work, act normal and pretend I wasn't sick until I got up from my desk every other Thursday and dropped off the wig at the hair dresser (I never spent so much money on my hair before) and then met my friends who would take me to chemo, then decide what we would order in for lunch, look up old boyfriends and watch daytime TV. After chemo ended I was scheduled for a lumpectomy a month later. Unfortunately the margins did not come back clear and two weeks later I was in surgery for a double mastectomy. I remembered leaving work the day before the surgery so scared that I was going to be in so much pain. In reality I felt nothing, and two years later I still feel nothing because the entire area is still numb; my plastic surgeon said it would probably always be that way. One thing that really helped was physical therapy to get my range of motion back and helped with the effects of the expanders the surgeon implanted until I returned for the real thing—breast reconstruction! After that surgery I waited a month and then started radiation every day for seven weeks. The burning was really uncomfortable but as all my doctor’s told me: I had no choice. Radiation was my insurance policy; I never wanted the cancer to return, then look back and wonder why I chose to stop treatment after surgery. One silver lining in the entire process was that I gave myself free reign to buy Hermes scarves, only wearing the dreaded wig to work! In November of 2013, an inner voice kept reminding me of how I needed to go get my mammogram—I thought I was just a few years behind. Busy with young children, time just flew by. When I finally did make my appointment a few months later, I found out I was six years past due. I was not too concerned because I have no history of breast cancer in my family. During the mammogram, the techs saw what they called “lines everywhere” and whisked me away to get an immediate ultrasound. During the ultrasound the radiologist came in and told me I have a malignancy, and I was astounded! I could not believe it! I was there, all alone and they are telling me that—instead of just informing my doctor and letting him tell me. They gave me the option of performing a biopsy right then and there, or have me leave and contact my doctor. In shock, I chose to contact my doctor. I went to the car and just cried and cried. It was the scariest time of my life to be told I have cancer! I have always worked out and taken very good care of myself and I was in disbelief. My doctor was also shocked at how the radiologist handled things and referred me to a doctor of his choosing. I then went to this new doctor who had a very caring staff. They ran all kinds of tests. They said I had Stage I local breast cancer and I needed a lumpectomy. In the meantime, my husband, who works at the Liberty Group in Houston, reminded me of how his boss, Ken Bohan, was friends with Emma Jacobs, and how if I needed a second opinion she could get me in at MD Anderson Cancer Center in Houston, TX, right away. Once again, my inner voice was telling me to get a second opinion! Thank God for inner voices!! I told him I wanted a second opinion and Emma called me right away and got me in to see Dr. Anthony Lucci. Dr. Lucci then told me that at MD Anderson, they would have to rerun all my tests because they find mistakes in past tests every week. After the testing, Dr. Lucci said that I didn't have Stage I, but at least Stage II breast cancer. But because of the size of the tumor, they were not expecting any cancer to be in my lymph nodes. However, one lymph node in the armpit of the cancer side was larger, so they performed a biopsy and it came back benign. They also found two other suspicious areas in the same breast, so they said I could do two more biopsies or have a mastectomy because if even one of those came back cancerous I would have to have a mastectomy anyway, so I chose the mastectomy. During surgery, six of my axilla lymph nodes “lit up” when they ran the dye showing cancer and all of my lymph nodes had to be removed on the left side. I woke up in shock and disbelief when I was told that I had Stage III local advanced breast cancer. Even Dr. Lucci was shocked with the tumor size; they couldn't believe it was in my lymph nodes. I then was told I would need chemotherapy and radiation. My husband and I were not comfortable with the first doctor I saw in oncology. We could not seem to get answers; we felt as if she was very negative and we felt like we had to figure everything out ourselves from the paperwork that was handed to us. Once again I contacted Emma and she got me right in the see Dr. Jenny Chang at Methodist Hospital in Houston. She and her staff were so wonderful to me!! They were very positive and told me the kind of cancer I had was what they have had the most success with, and she thought I would be cured. She also told me that if I wanted to, I could use “Cold Caps” and save my hair. This was so important to me because my hair is already baby fine and I was afraid I would be one of the 6% of cancer patients with permanent hair loss. A very good friend of mine, Karey Albaugh, came to chemo with me and changed out the Caps every 30 minutes. The temperature of the “Cold Caps” was -28° C, and so miserable! They had to be on my head for seven hours every day of chemo. We even had to pull over on the on side of highway and change out these Caps when it was time. It was actually kind of hilarious! People who saw us were wondering what the heck we were doing. The Methodist Hospital staff was so amazing and kept me laughing all the way through treatment. I am so thankful for their caring staff and my friends and family who got me through my five months of chemo. After chemo, I was told I would need radiation. I was against radiation because of all the future health risks. Jenny Chang referred me to a wonderful radiation oncologist at Methodist Hospital, Dr. Ben Teh. He explained to us that if I didn't complete the radiation, there could be a 40% chance of reoccurrence. With that being said, I endured six weeks of radiation and the Methodist staff and my family and friends got me through it. I then went through reconstruction surgery and am very happy with the results. Today I am two years out and Cancer FREE! It feels so good to be here with my family and I thank God every day that I AM A SURVIVOR!! I remember clearly the day in late November that my mother sat me and my sister down to tell us she had chosen to radically remove both breasts and have reconstructive surgery after many bouts with both Ductal carcinoma in situ (DCIS) and Lobular carcinoma in situ (LCIS) in both breasts—a day I thought would live on in my mind as one of the worst in my life. That is, until I had to call my mom and tell her they had found something on my very first mammogram. And worse yet, that I had cancer. I am the poster child for early detection, based on the history of cancers in my immediate family. My Ob/Gyn wrote me a prescription for a mammogram and said, " Just get it done before your 36 years old. OK???" So, about four months before my 36th birthday, I walked in and got my first ever mammogram. The following morning, I got a call from the radiologist’s office, asking me if I could come back that day. What does one say? Ok. Not thinking much of it, back I went, for additional pictures and a sonogram. I sat alone in the waiting room, tears streaming down my cheeks, not knowing what was to come. The doctor called me in to tell me they found something resembling tiny pin pricks along my ducts, smaller than my pinky fingernail. He was going to send my screens to my Ob/Gyn, Dr. Alan Friedman, with a recommendation for a biopsy. He assured me that based on my age and health, the odds were in my favor. 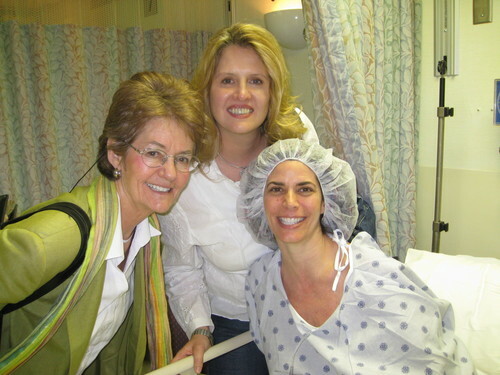 Enter Dr. Rachel Dultz of Princeton, New Jersey, a wonderful woman, a fantastic doctor and an amazing surgeon! My biopsy was scheduled for the end of February, and on March 2, well after 5pm, Dr. Dultz called me personally. Sigh—you just know what's coming—my world fell apart. I'm 36 years old. How could this be happening?? I was diagnosed with Ductal carcinoma in situ (DCIN), a non-invasive very early cancer. My medical oncologist actually said, “If you have to get cancer this is the one to have.” Doctor humor, I suppose. Again, based on my family history, and the fact that my mother’s diagnosis was well after menopause had begun, my oncologist thought it best to have the BRCA testing, as her recommended treatment would be based on the results. One bright note—I tested negative for the BRCA gene. Granted, genetics regarding cancer change daily, but given the present information and technology available, we were at least clear on that front. At this point, Dr. Dultz scheduled my surgery. My follow-up to the surgery was six weeks of radiation. I did see a medical oncologist and discuss the addition of Tamoxifen in my protocol; however, based on the limited amount of information regarding women of my age and the drug’s success, I opted to not take it.